Hardware: Rivals could be the new Rocket League. If one ignores the fact that the car chases take place not in arenas, but in places that vehicles can not bounce, but are instead equipped with rocket launchers and Minigun, and that is not about goals but firings, then one can already say that. 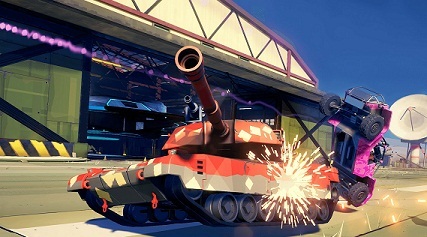 Hardware: Rivals is an action game, which consists of racing simulation and shooter elements. Describing Rocket League, with the hardware: Rivals currently is compared simply as Car Football, mention may be made as HR Auto Shooter. In one of the different vehicles, ranging from fast buggies to heavy tanks, you bang through the different levels and provides with self-assembled weapon systems firefights with other players. For every wining you gather recovery points, which you can then invest in the menu between matches in upgrades for your vehicles or your driver. Each Arena offers different challenges, such as race, kill streaks and other achievements that are to outdo your friends in the PSN friends list. Below we show you an overview of all the upgrades and the unlock conditions and effects of any upgrade in the five categories of targets, drive, defense, tracking and weapons. In the following we have listed all the upgrades of the above categories. Here you learn how you can unlock the upgrades and what they bring you in the fight against other drivers. Select Tommy, Gwen, Frank or Kat and reach a higher level to unlock upgrades. The upgrade of this type gives you a better target acquisition. In addition, it increases the target detection radius for all your weapons. Level 2: Targets are detected faster and your ammo will be increased quickly. Level 4: All weapons will receive a larger target detection radius. Level 5: Your primary weapon is improved. This upgrade helps you to maneuver through the deadly battlefield. More acceleration saves you from sticky situations and with more control in the air you can tackle your enemies with great style. Level 7: You have the air more control over your car. Level 9: Increase your acceleration. Level 10: Reinforced brake provides better cornering. With these upgrades all vehicles get a self-repair sequence and better armor. For offensive players, these improvements are particularly useful. Level 12: In a serious damage self-repair sequence is activated on your combat vehicle. Level 14: You have more armor. Level 15: The effectiveness of repair power-ups will be increased. The localization increases the effectiveness of your radar. You see power-ups (also called pickups) near and reduce your visibility to enemy radar systems. Level 17: Your radar shows the future to a larger area of effect. Level 19: Power-Ups (pickups) close, will appear on the radar. Level 20: Your activity on enemy radar systems is reduced. You can unlock these upgrades later in the game. You shares more damage with your weapons, and improve loading times. Level 22: The reload your secondary weapon is reduced. Level 24: You share more damage with primary weapons. Level 25: The radius of the environment damage of all weapons will increase.